Skilled cardiac surgeons at GW Hospital perform a comprehensive range of procedures — such as valvular surgery (including mitral valve repair and transcatheter aortic valve replacement), extracorporeal membrane oxygenation (ECMO), innovative coronary artery bypass surgery and other revascularization procedures — to help patients with advanced heart disease. Surgeons at GW Hospital saved these patients' lives. Many patients with heart disease have serious blockages in the arteries that supply blood to the heart. When minimally invasive techniques, such as angioplasty, can’t be used to improve their conditions, patients may benefit from coronary artery bypass surgery. Surgeons at GW Hospital use advanced strategies and techniques to perform bypass surgery, including conventional procedures using the heart-lung machine and newer “off-pump” techniques. When performing traditional bypass surgery, surgeons make an incision down the center of the chest and separate the breastbone to reach the heart. The patient’s heart must be stopped during the procedure, so a heart-lung machine is used to pump blood throughout the body. Surgeons then graft a section of a healthy blood vessel — usually from the leg — onto the affected vessel to reroute blood flow around the blockage. This procedure can restore blood flow to or “revascularize” the heart. It also may reduce chest pain and lower the risk of heart attack. Surgeons at GW Hospital also employ newer procedures that allow them to perform bypass surgery without stopping the heart. They can immobilize a section of the heart with specially designed stabilizers. The rest of the heart continues beating normally so a heart-lung machine isn’t used during the bypass procedure. Some patients who have blockages in multiple vessels benefit from different treatment approaches. For example, some vessels may be suitable for angioplasty, a procedure that involves threading a catheter through the body to the blockage and widening the artery with a tiny balloon or stent. Other blockages, however, may need bypass surgery. During a hybrid procedure, surgeons perform bypass surgery and angioplasty during the same operation. This procedure usually is performed without a heart-lung machine. 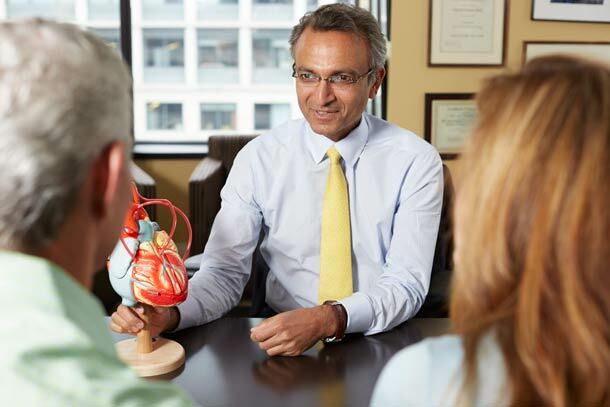 Conventional and minimally invasive approaches can be used to reach the heart. Heart disease can’t always be controlled with traditional medical or surgical treatment. Some patients, for example, don’t improve with medical therapy and risk reduction strategies, and they aren’t candidates for angioplasty or bypass surgery because they have extensive narrowing throughout their vessels rather than localized blockages. In the past, there was little to offer patients with refractory or difficult-to-treat heart disease. Now surgeons at GW Hospital perform a procedure called laser transmyocardial revascularization that can help some of these patients. Surgeons use a laser to burn small holes onto the surface of the heart. These holes stimulate the growth of new blood vessels. A variety of procedures are available to support patients with serious impairment in their heart functions including bypass surgery, valve repair and removal of non-functioning parts of the heart. In addition, a range of implantable devices can be used to assist the pumping action of the heart, for both acute and long-term heart failure. Mark Swartz is the first patient at GW Hospital to receive a left ventricular assist device (LVAD), a mechanical pump that keeps his heart functioning while he awaits a heart transplant. Using a combination of approaches, including minimally invasive techniques, surgeons at GW Hospital can reduce or eliminate the very common electrical irregularity of the heart known as atrial fibrillation. This can be done as a primary treatment for this problem or in association with valve or bypass surgery. GW Hospital is a regional leader in aneurysm surgery performing complex reconstruction in patients with aortic dissections as well as those with ascending, arch and descending aneurysms. Deep hypothermic circulatory arrest as well as perfusion-assisted techniques are performed. At times, the surgeon may be able to perform the procedure without the use of the heart lung machine.